Hara is a Japanese word that has no equivalent in English. While it literally refers to the lower abdomen, the term also has psychological and spiritual connotations in Japanese language and culture. In fact, hara can be seen as the unification of a person’s physical, psychological and spiritual dimensions. Hara is critical to the Chozen-ji lineage of Rinzai Zen training. The development of hara is emphasized in all of our practices, zazen (“Zen meditation”), martial arts and fine arts. From our perspective, there is no Zen without hara. In spite of the importance of hara in Japanese culture, few people know of it in the West. This is a shame. The purpose of this blog is to remedy this situation, so that people everywhere can benefit from developing and using the hara: their own vital center. In the early stages of my Zen training, I thought that the way to engage the hara was to purposely put tension in my lower abdomen. This did not work; my breathing didn’t change. After my initial “discovery” of my hara, I continued to emphasize tension. Over the years, I have come to see that hara breathing involves a dynamic of tension and relaxation. The major muscle of inhalation is the diaphragm, a dome shaped structure with muscle on the sides and cartilage on top. It sits right below the thoracic cavity. When the diaphragm contracts, it creates negative pressure in the thoracic cavity, drawing air into the lungs. However, we have hardly any proprioception of the diaphragm. We do have better sense of the other muscles involved in breathing. 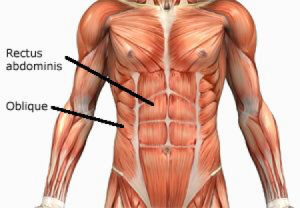 Of these, the rectus abdominis is the probably the most significant in hara breathing. The rectus abominis is the “six pack” muscle that extends roughly from the base of the sternum to the pubic bone. In developing hara breathing, we learn to simultaneously tense and relax different parts of the rectus, as well as other core muscles, such as the obliques. In my experience, the relaxation starts at the bottom and works its way up. This relaxation allows gravity to pull the viscera (your “guts”) downward, enabling full range of motion of the diaphragm. Since muscles can only contract, they have to be extended through the activity of other muscles. For example, if you contract your biceps, your arm bends. But the biceps can’t then push your arm back to an extend position; you have to contract your triceps order to straighten your arm and this motion lengthens your biceps in the process. In the same way, the diaphragm can’t push itself back up. Instead, the contraction of the abdominal muscles puts pressure on the viscera, which push the diaphragm upward, ready to contract again for the next inhalation. 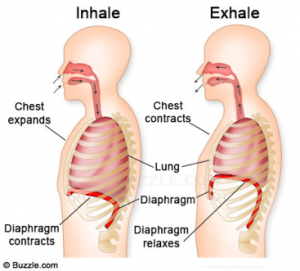 In hara breathing, the exhalation is driven by differential contractions and relaxation of the rectus abdominis. The lower part of it remains largely relaxed, while the top part, right under the sternum, contracts, as if curling down and inwards. My teacher used to stress that the top of the abdomen should become soft and somewhat indented. As a result, air is expelled from the lungs, while the lower abdomen remains expanded. With practice, one can inhale and exhale deeply, without putting undue tension in the abdomen. Of course, there may be times when more abdominal tension is desirable, e.g. in exercises such as ah um breathing, chanting, or when power is needed for marital arts or lifting. However, there will still be differential relaxation and tension of the abdominal core. I recently had the opportunity to video record Honda Roshi playing the shakuhachi (Japanese bamboo flute), first with his gi (top) on, and then with it off. With gi on, it looks like very little is going on in his lower abdomen. However, as you will see in the second part, his lower abdomen remains expanded during inhalation and exhalation, while the top of it contracts and seems to curl in when he exhales. When he inhales, his upper abdomen relaxes but his lower abdomen remains expanded. The video also illustrates the ideal length of inhalation and exhalation during zazen. His breaths in are quick but deep, while his exhalations are steady and prolonged. Exhale completely. Simultaneously, contract your abdominal muscles as if you were bringing your naval to your spine. You can do this either standing or seated. If seated, try to maintain good posture as shown in the post on hara and zazen. Continue to tense your abdominals as much as you can. After about 10 seconds, release the tension as you inhale. It should feel like you are suddenly letting go of something clenched in your fist. Pay attention to the sensation of relaxation spreading in your lower abdomen. Experiment with a fast or slow release; determine which one better relaxes your lower abdomen. You can repeat this sequence as much as you wish, as long as you take some normal breaths after each repetition. If you find yourself getting light headed, take a break. Once you can feel your abdomen expanding when you inhale, see if you can increase its range of motion by relaxing your lower abdominal muscles even more. As you relax more, it should feel like the force of gravity is pulling your viscera downwards as you inhale and that this force is driving your inhalation. The use of a HaraMeter® can be helpful because it can give you visual feedback on the range of motion of your lower abdomen. This exercise can also be helpful for more advanced practitioners—those who already can do hara breathing. They should concentrate on expanding the range of motion in the lower abdomen and on deepening their inhalation. Again, I recommend experimenting with both short and long inhalations. After a while, see if you can gently set your hara by curling in the top of your abdomen while keeping your lower abdomen expanded (as you can see Honda Roshi doing in the video). Remember, the key to this exercise is relaxation, not tension. With time, a long, relaxed inhalation should become second nature.